Outside my window... it is cool! Yay! But all my windows are fogged up. What's up with that? I am thinking... about the oh so comfortable ruts we find ourselves in, and how maybe, just maybe, it takes a little, or a lot, of pain to move us to a different place. I am thankful for... the fact that I really like, and love, my soon to be daughter in law. I am so glad that I don't have to "make nice"--it can really BE nice. Yay! From the kitchen... the last of the freezer stuff this week. Should have been last week, but we got sidetracked. So it looks like Palouse with sausage tonight, sweet and sour pork on Wednesday, smothered steak on Thursday, tuna salad on Friday (ok, so that's not from the freezer! ), hot dogs for lunch on Saturday, and pork medallions on Sunday night. Got to find a recipe for those. When I am out on Tuesday, the folks here at home will probably have sausage and eggs. I am wearing... black track pants (that seems like a Monday staple), black shirt with big pink, orange and white dot flowers, black sneaks, groovy earrings (seriously--the best! They were my mom's) and Tiffany perfume. I am creating... the crochet blocks for my 2009 crochet along. Each month, the group posts 2 12 inch blocks--and I do 'em. At the end of the year, I'll have enough blocks to make 2 lap size 'ghans. I'll show you a picture when they are done. I am going... with Celeste to the florist to talk about bouquets and stuff. Then to the rental store to look at tablecloths. Yike! I am reading... a regency romance by Mary Balogh. I wanted to compare others to Georgette Heyer. I am learning there is simply NO COMPARISON. I am hoping... I can get the horizontal surfaces in my house cleaned off. AGAIN. I am hearing... Squirrels running across my roof. Darn those tree rats. They are pests, but God made them SO DARN CUTE and fun to watch. Around the house... there is way too much work to be done. Isn't there always? One of my favorite things... is the website Ravelry. If you are a knitter or crocheter, you should check it out. It is SO fab. 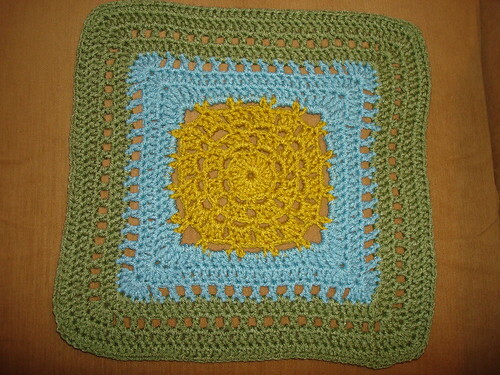 So many free patterns, you would be able to crochet your whole life and never get to the end. A few plans for the rest of the week: a fairly unplanned sort of week. I'm going to go with the flow this week, trying to DO more and THINK less. Words I'm pondering From Peter Kreeft: "We are all destined to be martyrs because our destiny is not merely to experience joy while remaining the same person, not merely to fill our existing capacity for joy. Rather, it is to increase that capacity infinitely by a bursting of our seams, a shedding of our snakeskins, a transformation from caterpillars to butterflies." This page contains a single entry by MamaT published on November 16, 2009 9:53 AM. Purty Puttern Tuesdee was the previous entry in this blog.